According to new calculations, China’s space laboratory, Tiangong-1 will fall to Earth in March 2018. While most parts of the spacecraft are likely to burn up in the atmosphere, there are concerns that some pieces, containing highly-toxic chemical, may hit the ground. Beijing lost control over Tiangong-1 on March 16, 2016, when it ceased functioning, most likely due to a dysfunctional battery charger. Since then, the module has been unable to recharge its batteries from its two solar arrays. However, first statements made by Chinese officials were laconic, informing only that the laboratory started to descend gradually and would eventually fall to Earth. China finally confirmed in mid-September 2016 that the spacecraft heads for an imminent re-entry, but still not disclosing whether the descent is controlled or not. First announcements made by China Manned Space Engineering Office (CSME) indicated that Tiangong-1 was then orbiting at an average altitude of 230 miles (370 kilometers) and was descending for its burn-up in the atmosphere in late 2017. In May 2017, China informed the United Nations (UN) that Tiangong-1’s orbit decreased to an altitude of 217 miles (349 kilometers) and is decaying at a daily rate of approximately 525 feet (160 meters). This indicated that the re-entry of the spacecraft is expected sometime between October 2017 and April 2018. Now, a new report issued by Aerospace Corporation, a non-profit corporation that provides technical guidance and advice on all aspects of space missions, predicts that Tiangong-1 will fall to Earth in March 2018, most likely in the middle of the month. However, what is alarming in this report is that it warns that parts of the spacecraft, which could survive the re-entry, may contain hydrazine – a highly-toxic material used in rocket fuels. “Potentially, there may be a highly toxic and corrosive substance called hydrazine on board the spacecraft that could survive reentry. For your safety, do not touch any debris you may find on the ground nor inhale vapors it may emit,” the warning issued by Aerospace Corporation’s Center for Orbital and Reentry Debris Studies (CORDS) reads. Hydrazine is used as a propellant for the maneuvering thrusters of spacecraft. Other variants of hydrazine that are used as rocket fuel are monomethylhydrazine and unsymmetrical dimethylhydrazine. According to the U.S. Environmental Protection Agency, short-term exposure to high levels of hydrazine may include irritation of the eyes, nose, and throat, dizziness, headache, nausea, pulmonary edema, seizures, coma in humans. Moreover, long-term exposure to this substance is believed to cause cancer in humans. In the report, CORDS also provided some insights regarding the possible location of the imminent Tiangong-1 re-entry. Its experts predict that the spacecraft will re-enter the atmosphere somewhere between 43 degrees North and 43 degrees South latitudes, most likely at higher latitudes. Therefore, this large swath of Earth includes Northern parts of the U.S., and such countries like Spain, Italy, Turkey, China, North Korea or Japan in the Northern hemisphere. When it comes to the Southern hemisphere, most probably it could re-enter over Chile, Argentina, Southern Australia or New Zealand. Generally, CORDS’ report delivers more detailed information about Tiangong-1’s re-entry than the latest note that China sent to the UN on December 8, 2017. The brief document only informed that the fall of the spacecraft is expected between the first 10 days of February and the last 10 days of March 2018. 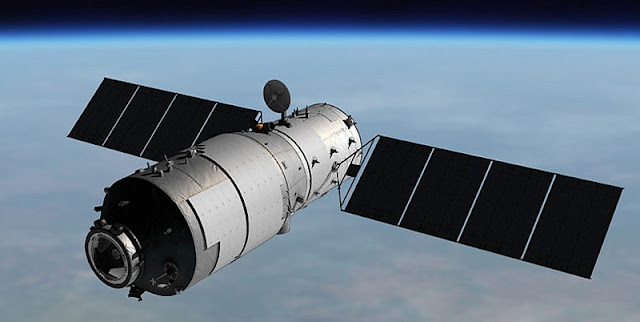 Beijing added that until November 26, the laboratory had been orbiting at an average altitude of 184 miles (296 kilometers) and insists that the Tiangong-1 and the fuel it contains, will not do any harm on the ground. “Based on analysis, the remaining small amount of fuel will be burned and destroyed along with its structural components during the course of re-entry and will therefore not cause any damage on the ground,” the note states. As was the case with previous note to the UN, China again assured that it is committed to further monitoring and forecasting the descent of Tiangong-1 and will inform the public as soon as more information is available. Tiangong-1 (“Heavenly Palace” in Chinese) is China’s first space laboratory. With a mass of about 8.5 metric tons, Tiangong-1 measures some 34 feet (10.4 meters) long and has a diameter of 11 feet (3.4 meters). The laboratory was launched in September of 2011. Nine months later, in June 2012, three Chinese taikonauts docked their Shenzhou-9 spacecraft to the station for the first time. The module was visited again in June 2013 when the Shenzhou-10 spacecraft transported another trio of taikonauts. Besides being used as a laboratory for research in space, Tiangong-1 also served as an experimental module to demonstrate orbital rendezvous and docking capabilities. The laboratory paved the way for China’s future space station, which the country plans to complete in 2022. Along with its predecessor, Tiangong-2 (launched in September 2016), it tested technologies crucial for the planned modular orbital outpost.